This vivaciously painted work is one of several interior scenes from the 1880s featuring portraits of Sargent’s friends. 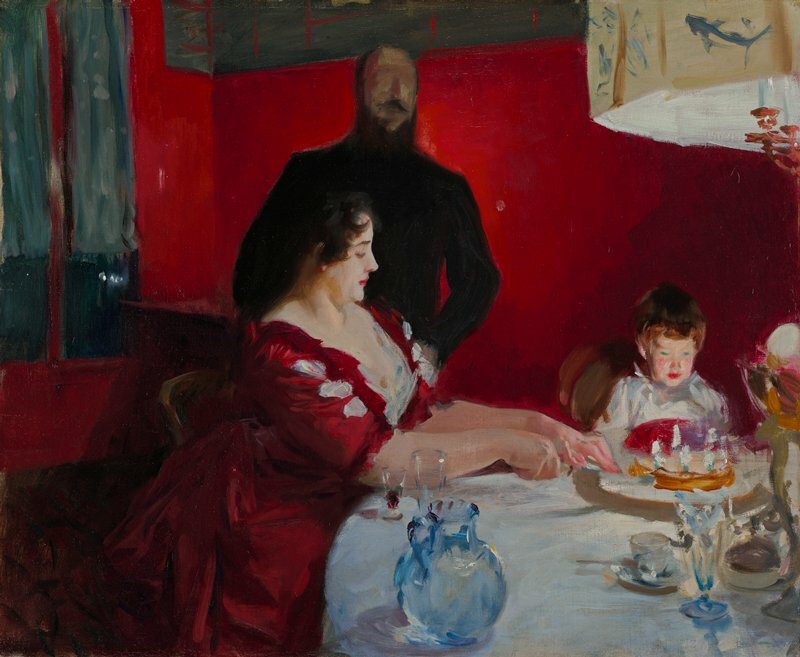 Here the French artists Albert Besnard (1849–1934) and Charlotte Dubray Besnard (1855–1931) are shown celebrating the birthday of their eldest child, Robert (1881–1914). The painting has traditionally been dated to 1887 based on the number of candles on the cake (apparently six). However, the looseness of Sargent’s brushstrokes makes the candle count an unreliable marker. A series of etchings of Robert by his father suggests a slightly earlier date. The same childish jowls, undefined brow, and innocent stare depicted by Sargent appear in the prints before 1886. Albert Besnard recalled Sargent painting the work in 1885. Robert would have been turning four. Charlotte would have been pregnant then, which could account for Sargent placing her maternal presence at the very center of his work.